As a nation, we may, eventually, choose to rate and rank high-profile politicians on their individual merits rather than praise or harry them for their party affiliations. Among a selection of bright young politicians constantly generating worthy content, is the 42-year-old MP for Serdang, Ong Kian Ming. A former consultant and a politicial analyst, he is a writer who consistently shares his thoughts on social media. Just the other day, Ong Kian Ming singled out KTM Komuter for criticism, suggesting that the 21-year-old service has drawn too many complaints. Widely tracked with every pronouncement earning impressive views, Ong Kian Ming should probably follow up with visuals of his experience as a KTM Komuter rider. The Malaysian public will benefit from the presentation of more facts. There is a KTM station in Serdang. Ong Kian Ming must have surely tried the service. You could journey from Serdang northwards to Segambut, Kepong and beyond. Intriguingly, I read somewhere that this young politician is being lined up as a candidate for the parliamentary seat of Kepong, a DAP stronghold, to replace Dr Tan Seng Giaw, the 75-year old parliamentarian. This is probably unfair; but, Ong Kian Ming's vociferous presence in a movement to say "No" to a waste-to-energy plant in the Kepong constituency has fuelled speculations of a switch. It is true that he has been associated with environmental causes ever since he was elected to Parliament in 2013. Still, the possibility of a switch to Kepong has lately gained traction now that Serdang is expected to be part of an expanded parliamentary constiuency that will include Bangi, in the redelienation of electoral boundaries. Question is, does the MP see himself as a truly Malaysian politician able to be elected from a Malay-majority seat. Or, is he about to move to a seat long deemed safe for the DAP. 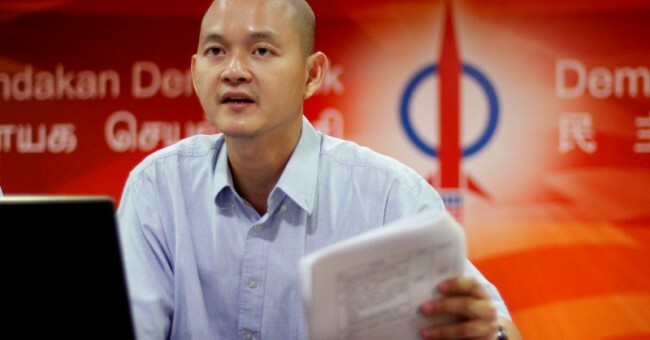 There is another possible scenario of Ong Kian Ming preparing to defend his Serdang seat. That there is a Bangi forest reserve and the fear of indiscriminate development in the area, may persuade him to stay given his activism as an environmentalist. It is obvious that his credentials as a conviction politician will be put to test. Already he is seen as a high-risk taker by planting himself in this movement opposing the proposed waste-to-energy plant in Kepong, from the off, when the full details were not immediately available. Perhaps it is inevitable for him to raise the decibel in order to maintain a high profile. In any case Ong Kian Ming has been exposed to scrutiny. Evidently, technology has neutralised some of the early concerns he raised, such as the emission of dioxin and ferun, or the permissible buffer separating the proposed plant from the nearest residential areas. As for the argument that there is already a landfill in Bukit Tagar, this sounds altogether weak. It reeks of the usual not-in-my-backyard syndrome. Experts should be similarly robust in articulating their enlightened views. Driving the conversation on waste-to-energy in past 5 years, Ong Kian Ming, had at a point, rubbished a Minister's suggestion that he Google a particular detail. The learned parliamentarian was telling Malaysians and future constituents that he was accustomed to thorough research and analysis. We are in an era where a basic understanding on anything could actually be gleaned, rocket science included. Well, one can always Google "rocket science". To cite a fragile argument, the MP for Serdang may suggest that Japan is phasing out waste-to-energy incinerators. Visuals will pop up within seconds to show the exact opposite. As Malaysia enters a phase of full disclosures and transparency, every single policy decision and contract awards shall be thoroughly examined. Opposition politicians will, of course, occupy frontrow seats. Equally exciting will be the counter-examination on intentions and pronouncements of those voluble personalities. It will be interesting to watch this showdown; Ong Kian Ming vs officials, planners, experts, politicians supporting a City incinenator. We wish to see a clean fight of a rigorous inspection of facts with lots of visuals. There can only be one winner - the Malaysian public. My boss lives in Bandar Baru Bangi and has been living there for many years. He is a staunch BN supporter but he concedes that Ong Kian Ming is a really good MP. Worth every penny. He’s a whole lot better that previous ones. Very hardworking and have a really good work ethics. He takes his job seriously. With the kind of output he produces, you can tell he earns every single cent of it though being an MP in Malaysia is not a well paid job. But he seems like he enjoys doing it. It is going to be a lost to Bangi and Serdang folks if he relocates. Aduhai YB. Tuan Berjaya kerana undi di Serdang. Balaslah budi mereka yg buat tuan Berjaya. Jangan main catur untuk Berjaya diri sendiri. Tuan mesti yakin boleh Berjaya dalam Bangi. Tuan tak akan Berjaya di Kepong. Kerana Kepong sudah ada orang yang Berjaya. Kami di Kepong sekali-kali tidak akan buat tuan Berjaya di tempat kami. Cekap pasat KTM (Kereta Api Tanah Melayu) Wa pon manyak helan nea aa , lulu zaman tatak sangat maju, KL> JB , JB>KL atak itu lirect service ,sikalang konon manyak maju itu service sutak kasi tatak lagi loo oo,manyak helan lay yy. Mula-mula tatak pecaya ,satu hali Wa betut-betu pegi tanya , lia olang cekap mau kena tukak keleta api itu lekat Gemas maa aa,manyak leceh loo oo,itu tua-tua punya olang apa macam maa aa,betut-betut kasi lebih susah maa aa. Sikalang macam-macm cekap pasat krleta api laju , sutak atak punya kasi lebih susah lebih slow ,balu punya balu celita saja maa aa. Sorry bro. You may want him to serve Serdang but dont you think that he is not interested in serving his voters especially the malays. The Malays in Kepong do not welcome him. He is more prepared to serve his agenda, anti incinerator. Or serving someone who is against govt project on waste-to-energy. I remember there's one NGO in Kepong who declares that they are anti-wte. Do they know each other? Opposing the WTE plant (or any other thing) before knowing the details cast doubts about what is he really fighting for.. This means even if the WTE plant is proven to be more environmentally beneficial in the long run than other methods of waste management, he would still be opposing it. No doubt raising hell over the issue will give him a good excuse to march over to Kepong, all guns blazing. But without the details the blazing guns will just help mesmerize his suporters as the real target has yet to be known. Moving to Kepong on the premise of fighting the establishment of the WTE plant would be very handy as it will also provide him a safe seat. But if the fight against the WTE plant is just to gain a foothold in Kepong, then an environmental knight in shining armor he is not. If BN wins then national debt will guarantee surpass RM1 trillion. If PH wins, they propose to abolish GST, tolls and many more and if the debt still surpass RM1 trillion but it is still logical kan? Who knows with a dedicated and proven people in PH (eg. Selangor & Penang) the debt might even be reduced from the present level. I would rather give PH a try. Tak semesti nya utk jadi ahli politik kita kena ada pelajaran tinggi sampai ka phd. Dulu2 Wakil rakyat pun ada yg setakat darjah 6. Ada wakil rakyat morib dulu storekeeper je n yet berjaya sampai dpt gelaran tan sri . Yb Ong ni tak perlu la menonjolkan diri sebagai pejuang itu atau ini. Jadi la wakil raykyat yg cekap , bersih dan amanah. Contohi la Tan Sri Lee Lam Thye. Sapa tak kenal tan sri lee ahli parlimen bukit bintang dan kuala lumpur tahun 1969 dulu. Tan Sri dedicate himself as a fulltime Wakil Rakyat. Dia d senangi oleh semua lapisan rakyat. Rumah nya d tman maluri sentiasa terbuka. Sebut je malapetaka kebaran , banjir kilat tan sri yg akan sampai awal. Tan Sri bekekerja tak kira waktu dan masa. Tan Sri berkhidmat utk pengundi2 nya. Kalau letak MO1 lwn tan sri di kuala lumpur kecut teloq. Kpd YB Ong be an honest Politician tak perlu main wayang. YB2 Malaysia ni patut contohi TAN sri Lee lam thye saorang yg cekap amanah dan bersih. Leaabe Dr.Tan alone please.
" The learned parliamentarian was telling Malaysian and future constituent that he was accustomed to thorough research and analysis ." Well Annie ..this Ong fella is giving you the DAPis salute ... real pisss. In malay term " koncing ". If he is so thorough in research , why did he participate in Anti-Lynas demo couple of years back together with the Un-Bersih clown . He should know that the radiation emmited by our household TV and lighting are much higher than those processed in Lynas . Don't be fooled by Ong Ka Ming. He is a cunning politician in the disguise of an environmentalist. Manipulating environmental issues just to get public attention and project himself as a young bright politician. He sees Kepong as his safe heaven for GE14 and ready to trample over the well-respected Dr Tan Seng Giaw to save his political carrier.